Bharat Sarkar (Indian Government) eyes pucca house over every Indian family by 2022. Our Government is providing intrerest subsidy upto Rs 2.67 lakh on your home loans under Pradhan Mantri Awas Yojana (U). Are you eligible? Lets find out what is Pradhan Mantri Awas Yojana and eligibility conditions for availing subsidy. Pradhan Mantri Awas Yojana (PMAY) has been launched by the Government of India with the sole motive of making housing affordable for all by 2022, especially for the economically weaker sections of the society. It has a Credit-Linked Subsidy Scheme (CLSS) where applicants can get home loans at subsidized rates. Loans under this scheme can not only be availed for construction of a house but also for purchasing a new or a pre-built house or for renovating the house. The urban leg of the scheme focuses basically on four different sections of the society, namely, EWS, LIG, MIG I and MIG II. 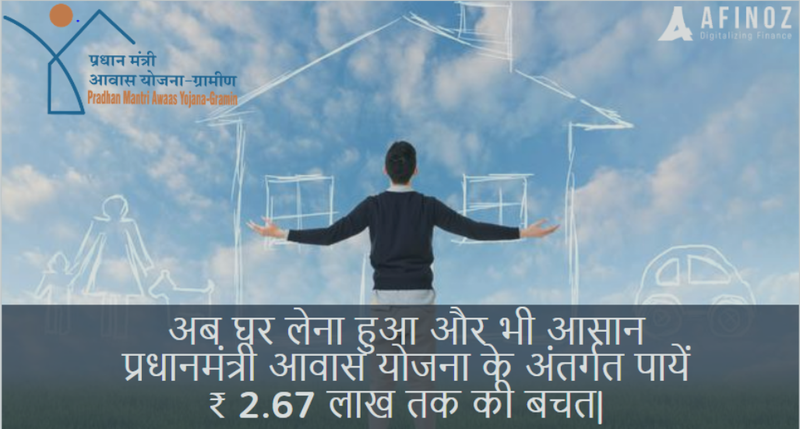 Benefits - You can save upto Rs 2.67 lakh on your home loans under Credit Linked Susbidy Scheme under Pradhan Mantri Awas Yojana (Urban). The maxmium monthly savings will be Rs 2,579 and the annual savings can be Rs. 30,948. The new property should be in the sole ownership of the female member of the family or in the joint ownership of the wife and the husband. In case of construction on an existing piece of land or renovation of the existing kachcha or semi-pucca house, this criterion is not binding on the applicant. The family applying for this scheme should now own an all-weather housing unit in any of the family member’s name throughout India. For EWS category, the carpet area of the house should be up to 30 sq.m. For LIG category, the carpet area of the house should be up to 60 sq.m. Property location should come under statutory towns as per the census of 2011 and their adjacent planning area. The carpet area of the house should be up to 160 sq.m. for MIG I category. In the case of MIG II category, the carpet area can be up to 200 sq.m. None of the members of the family applying for the subsidy should own a pucca house in any part of India. Applicants in this scheme are defined as a family consisting of husband, wife and unmarried children. Any adult earning member can be treated as a separate household even if the person is unmarried. In case of married couples, any of the spouses or both are eligible for a single house depending on the income group they fall into. It is not mandatory to have female ownership for MIG households. An applicant must not have availed any form of assistance either from central or state government for any housing scheme. It is mandatory to furnish your Aadhaar card to avail the subsidy. Proper documents have to be submitted to authenticate the income group a family falls into. The carpet area mentioned above is the net area of the floor enclosed inside the external walls of the house excluding the floor area of external walls but including the floor area of internal walls. It is the time to own your dream home. And leverage subsidy upto Rs 2,67,280 on your home loan interest under Credit Linked Subsidy Scheme of Pradhan Mantri Awas Yojana. logon to www.afinoz.com or give us a call at +918795021552or mail us atinfo@afinoz.com and we are here to assist you in the best possible way.